Solifluction features in East Iceland. Sheep (white spots) give the scale. ÓA sá ástæðu til þess að skrifa sérstakt rit um frost og áhrif þess, m.a. til að nota í kennslu: "Kulferli, frost og mold" (Rit LbhÍ nr. 26). Frost hefur gríðarleg áhrif á jarðveg og landslag á Íslandi: nánast allt yfirborð landsins er markað af frosti með einhverjum hætti. Íslensk mold er frostnæm (frost-susceptible), vegna eðliseiginleika hennar, með öra vatnsleiðni og mikla vatnsheldni. Frost-þíðu hringir eru tíðari á Íslandi en annars staðar á jörðinni. Frostið myndar þúfur í grónu landi og veldur jarðsili hlíðum (hægt skrið moldarefna niður hlíðar). Melatíglar og önnur fyrirbrigði myndast á ógróun landi og rústir til heiða. Frostið myndar ógegndræpan ís undir yfirborði auðna, sem hefur mikil áhrif á vatnafar landsins. Ísnálar sem myndast í ógróið yfirborð hamla framvindu gróðurs. Hugtakið "þúfur" er æ meira notað í alþjóðlegum fræðum. Beit ýtir undir myndun þúfna. Frost has pronounced influences on soils and landscapes of Iceland. The soils are generally very frost susceptible, rich in silt. Colloidal constituents of the soils retain large quantities of water but behave like silt with rapid hydraulic conductivity and frost susceptibility. Winter temperatures are characterized more frequent freeze- thaw cycles than known elsewhere. The soils lack layer silicates (clays) that provide cohesion for soils elsewhere and they are easily deformed by frost. Many are phixotropic at high water contents. The soils are often heavily cryoturbated, but periglacial landforms characterize the landscapes, especially thufur (hummocks), solifluction features (terraces and lobes) and patterned ground on many deserts. 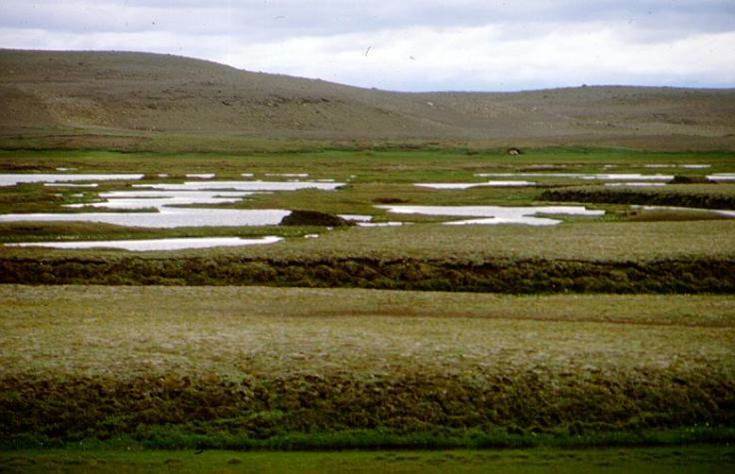 Thufur occur in areas without a shallow water table, because of the combination of soil properties and climatic factors, often enhanced by grazing of animals. 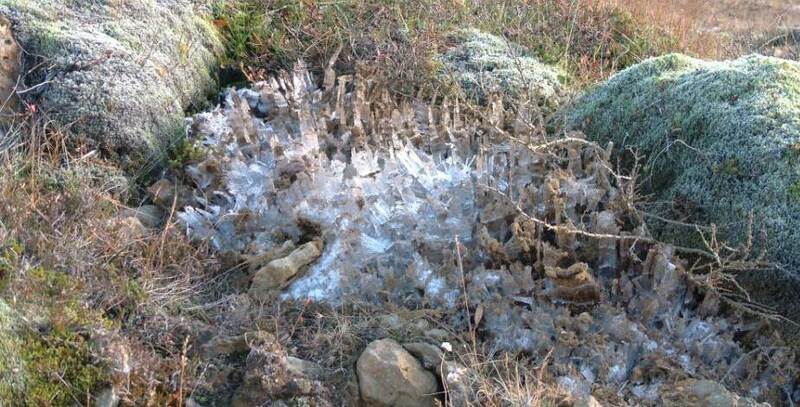 Needle-ice formation is extremely common on barren surfaces in winter, having pronounced effects on surface stability and negative effects on primary succession. Palsas occur in some highland areas. Permafrost is confined to the palsa features and very high elevations (Abstract of Chapter 10 in "The Soils of Iceland"). Typical thufurs. Note hiking pole laying on the ground to give scale. The magnificent Orravatnsrustir plasas in the NW highlands.